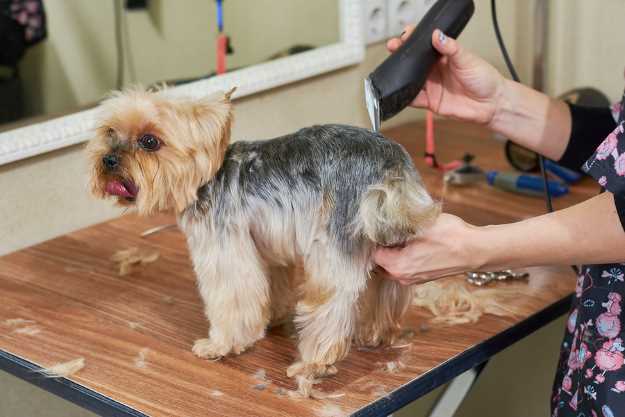 Have you ever thought about doing some dog grooming using hair clippers? Dog grooming is one of the things that you cannot avoid as a dog owner. It keeps your pet appealing, happy, and healthy, giving you that well-deserved peace of mind. It is easy to rely on a professional dog groomer, but it is more fun (and economical to attempt the task yourself, not to mention the advantages. AND, not as hard as you might think. Do I know how to groom a dog using hair clippers? If not, sit tight and read on. This article will discloses all the details. The first step in the planning phase involves obtaining the necessary tools. Sounds easy, but it might be the most confusing part of the process. At first, you may find that acquiring the necessary equipment can be costly and confusing. To be honest, there are some initial start-up costs. You will make up these expenses within the first year if you do your grooming at home. Plus other grooming supplies such as shampoo, wash tub, combs, brushes, mat rakes, scissors and so forth. In this article we will touch on all of these supplies. Sharp blades. To get a polished finish, you must find a clipper with sharp blades. Blunt blades force you to use a lot of pressure to cut the hair. This will eventually cause injuries to your pet. Still, it is worth noting that while some of the clippers come with sharp blades, they will get blunt after the first or second use. Settle for quality brands to avoid such issues. For other brands of clippers, the blades are sold separately. Powerful motor. A good hair clipper must have the speed needed to cut your hair pet’s hair. Also, go for clippers that do not get overheated easily as it only tends to create discomfort for your pet. Be sure to settle for the products that make less noise. Ergonomic design. A firm grip will determine how well you will cut the hair. This must be considered in the clipper’s design process. They must be lightweight so that you can lift them with ease. The smaller sizes will also be better than the bigger types. Durable comb guide. It is by using a comb guide that you will cut the hair to a desirable length. You will soon learn that some breeds look good and natural with specific hair’s length. This includes a wide range of long haired breeds including the Soft-Coated Wheaten Terrier, bearded collie, Afghan Hound, and Havanese among others. Other breeds such as Australian cattle dog, Affenpinscher, Basenji, and Anatolian shepherd dog look perfect with short hair. It is only by using guide combs that you can get the ideal look. The combs must be durable. Combs are used over the clipper blades (Usually a number 30 or 40) and clip onto the blade itself. If you are doing dog grooming using hair clippers, you will need to purchase some quality clipper blades. Some clippers have built in blades that normally work well for most breed types. Other clippers may come with one blade, normally a number 10 and you will need to purchase additional blades depending on how much length of hair you want to remain on the dog. Clipper blades are numbered according to length of hair that remains on the dog after the trim. 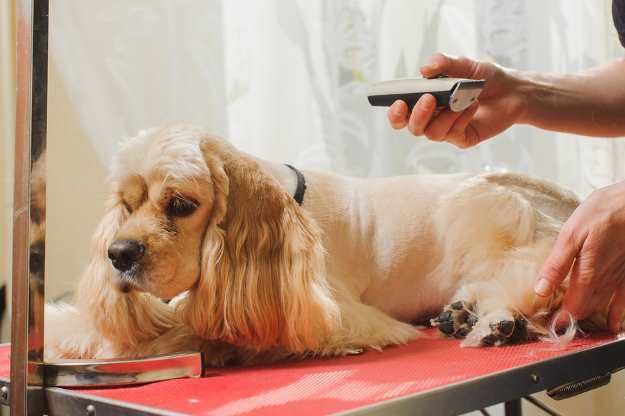 Sizes for dog clippers and human clippers are different, so this guide is for dog clippers only. Number 40 and Number 50 are normally used in veterinary hospitals but can be used with clipper combs. To give you a quick example of what blades are appropriate, most dogs that need trimming will have their stomach area, a sanitary clip and between their foot pads clipped. Dog grooming using hair clippers gives these area a clean, sleek look. A Matted coat will likely need a #7 to get under and through all the mats. A short coat will require a Number 3 or 4 or a number 30 plus a 3/4 to 1 inch comb. Any area that you will not trim with the clippers will need to be scissored. I've included scissors/shears below in the additional supply section. Depending on the breed(s) you will be trimming, you may need or want a different type of clipper. The first thing to consider when choosing your clipper is how it feels in your hand. If possible hold as many different types of clippers in your hands to see how they feel. Hold the clipper with the blade pointing downward. Are they small enough to fit into your hands when you hold them as if they were a pencil? Are they lightweight enough to prevent fatigue? Or, do they feel awkward and difficult manage? Dog grooming using hair clippers can become hard on your hands so you want the right tool to prevent unnecessary fatigue. Do you think you'd be happier with a clipper that plugs into an outlet or one that is chargeable and can be used without all those cords? If you do not have the chance to test the product, go through the reviews to find out whether consumers have major complaints or concerns. It is also important to buy clipper’s that are specifically designed for dogs. Human hair clippers may not give you the ideal results since the hair’s growth and volume is different. If you are also clipping cat hair, you can still use the same clippers but change out the blades. Dog grooming using hair clippers can leave your hands fatigued if you don't choose a comfortable hair clipper. In addition to the Clipper, you will also want to invest in some additional supplies that will keep your clipper running smoothly for many years. Hair clippers must be maintained in perfect condition to last for a long time. The process necessitates that you clean and lubricate them after use. Good hair clippers come with a cleaning brush to remove all the hair and a lubricant to keep them rust-free. You can also use sprays to disinfect them and coolant to keep the blades cool while in use. Blades should also come with a protective cap to avoid injuries and keep them in good condition while not in use. Good clippers should remain functional even after falls. As you begin to do more dog grooming using hair clippers, you'll likely need a storage system. It may be daunting to keep all the accessories in good condition and in one place if you do not have a bag or a case. Some hair clipper brands offer them freely but if not, you may want to look at options that work well for you. Blade wash will be useful for keeping the clipper blades clean and disinfected. This is particularly important if you are grooming more than one dog or if a dog has a skin infection that could be contagious. Clipper Brushes often come with the clipper kit and are used to brush away all of the loose hair that collects on the blade. You can purchase other brushes if you don't like the one in the clipper package or use an old toothbrush, which will work just as well as the store-bought varieties. Clipper oil or lubricants are necessary to keep the blades moving smoothly and prevent lines from forming on the hair coat. Oil after each use and then use a clean cloth to wipe away any excess oil. Coolant spray is needed if the blades heat up and become too hot to touch. If they feel hot to you, they will be too hot for your dog and could leave burn marks and cause a great deal of pain. You don't want that to happen. You can either have an extra set of clipper blades to exchange if needed or spray the blade with a coolant to lower the temperature of the blade. If you are purchasing clippers for the first time, it is always a good idea to find one that doesn't heat up too quickly. Although not part of the clipper kit, you will also want an appropriate wash basin. It must be clean and sizable enough for your dog to fit in. Some people prefer using water tubs for the grooming purpose. At home, the bath tub, shower or even the kitchen sink can serve as the best place to bathe your dog. Regardless of your choices, your dog must be comfortable. Dog’s type of hair. Your pet is likely to have normal, dry, or sensitive hair. It is important to have this in mind so that you can purchase the perfect product. Manufacturers provide this information on the labels. For dry hair, the shampoos will contain ingredients such as peppermint oil and aloe. If your dog has oily hair, manufacturers avoid products that have an oatmeal base. They will include oat protein and hydrocortisone to treat your pet’s allergies and itches. Ask your vet to help you determine your dog’s hair type. Your dog’s age. Some shampoos are only meant for puppies while others can be used by dogs of all ages. If you are worried about getting shampoo in your dog's eyes, use a tearless puppy shampoo on the dog's face. Fragrance. Some dogs are irritated by shampoos with strong scents. Go for fragrant-free products in this case. On the other hand, a dog that tends to be playful and hence dirty and smelly, some good fragrance will help. Always go for soft towels for your dog’s comfort. They must be clean to eliminate the chances of infections. They will help you to wipe off the dripping water and shampoo from the ears and other sensitive areas. A good leash to restrain the dog during grooming. The right leash should have: A good material. Nylon is better than most materials since it does not cause burns when a dog is pulled. Stylish. You do not want to be the owner of a dog with the ugliest leash in your neighborhood. Find a product that has the colors and design that blends in with your sense of style. When dog grooming with hair clippers, don't neglect combing and brushing. Beyond Clippers and Bath Accessories, you may also want to invest in good quality steel combs and dog brushes, the type would be determined by the dog breed. Mat rakes and splitters. It must be designed in such a way that: It can pierce through the tough mats and tangles without causing discomfort to your pet. The blades must be sharp. It is durable. Steel and aluminum materials are ideal in this regard because they are sturdy. The second part of planning for grooming is preparing the dog for the process. 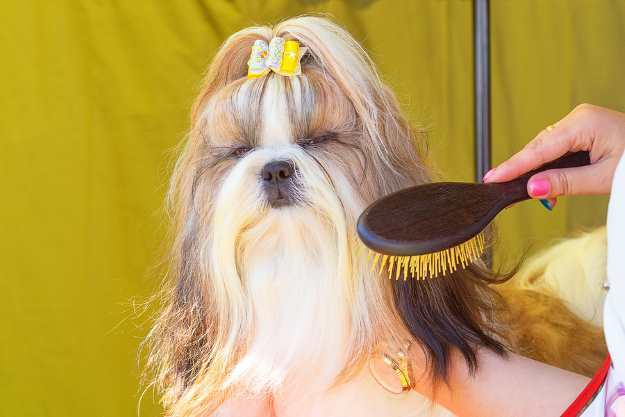 Just like kids, many pets resist the process of grooming. They would rather play or sleep. Avoid this by offering your dog treats and rewards to reassure them. The environment in which you groom the dog must be free from distractions and noise. It is also worth noting that a young puppy will adapt to the process more easily than an older dog. Training must hence start early. A collar or leash should be used to restrain the extremely restless dog. You can also seek help from your friends or family if you need a second pair of hands. Even before you pick up those new clippers, you will want to do a few preliminary steps. Detangling or dematting using a pin brush, mat rake, at splitter and dog metal comb is the first step. A detangling spray is also very helpful for removing mats. Large mats are hard to remove and as such, you must set sufficient time for it. Concentrating on the process is essential. There are higher chances of restlessness in this stage. You must reassure your pet so that you don’t take longer than necessary. Once you have removed all the mats and tangles, the next process is to clean your dog’s hair. You can use a bathtub, basin, or a standing shower. The water must be warm to eliminate discomfort. Clean the hair thoroughly using shampoo. You must never allow the shampoo to drip to the dog’s eyes. Also, remember to put cotton wads on the pet’s ears to absorb all the excess water. Use conditioner if needed and rinse thoroughly. Pat dry with a soft towel or use the hair dryer to get all the moisture out. This process is critical because it determines whether you will get a pain-free hair cutting experience. The clipper blades glide smoothly on wet and dirt-free hair much easier than if you try to clip a dirty dog. For a perfect cut, shave with the direction of the hair growth. Opting for the opposite direction may create harsh lines. It is important to acknowledge at this point that a dog’s hair grows in unique ways. It changes directions in some parts of the body. You must always pay close attention to this lest you hurt your faithful companion. Gentle, slow strokes are preferable than longer strokes. You will not only avoid accidents, but you will also get precise cuts. Always start with the most sensitive areas such as ears, underarms, and belly. Shaving the rest of the body will be achievable even after the dog becomes restless. As mentioned earlier, hair clippers tend to get overheated over time, it is vital to have lubricant or spray with you. Use it to cool the clippers to ensure maximum comfort for your pet. You can also change the clippers or blades. Taking short breaks is also worthwhile since you will have time to breathe and take away the tension off your dog. With almost 400 dog breeds world wide, it would be impossible for this article to go into detail about grooming each of them. Serious home groomers normally start by viewing videos or searching grooming books. YouTube is the best place to get free grooming advice for your breed of dog. I've added a few books that are helpful for the beginner wanting some general information. Many people will practice dog grooming using hair clippers at home, enjoy it so much that they will enroll in a professional grooming school. There are schools all over the country and world so if this is something you are interested in doing, a quick Google search will show those grooming schools near your home. Many people will also choose to enroll in an online grooming school. There are many out there, some better than others. I've listed a few for you to check out. I have not evaluated these for quality, cost, and thoroughness, but simply offer the links for you to consider. And there you have it! Grooming your dog using hair clippers is fun, exciting, and fulfilling once you find the ideal products and follow all the necessary procedures.